Last month Sony and Verizon announced the Xperia Z4v, a slightly enhanced version of the Z3+ which will be exclusive to the carrier nicknamed Big Red. This arrangement follows in the footsteps of the Z3v from last year, so it's no surprise really. One of the important details that was missing from the unveiling of the Z4v was its release date. Thankfully though, Sony has now decided to give us that. As you can see, it will be August 13. 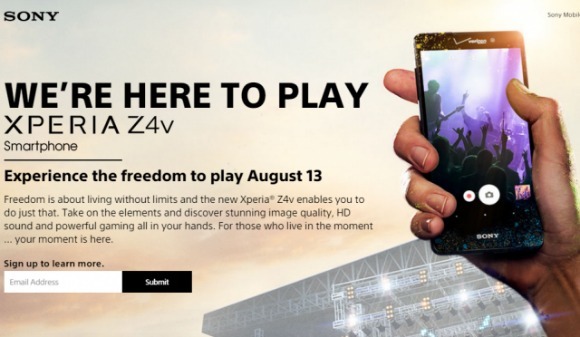 The image above is basically a screengrab of Sony's official microsite for the Xperia Z4v, so we expect the date to be correct. Unfortunately we still have to wait in order to find out anything about how much you'll have to pay for the device. That said, we can't imagine it will be cheap given its high-end specs. The Z4v sports a 5.2-inch QHD touchscreen, Qualcomm's Snapdragon 810 chipset, 3GB of RAM, 32GB of storage, a 20 MP rear camera with LED flash, a 5 MP selfie shooter, and a 3,000 mAh battery. It runs Android 5.0 Lollipop.